If you can’t see the smile of satisfaction broadly navigating my face as I write tonight’s blog, you never will. When it’s bike related and daughter related, I can’t help myself. My daughter is about to head back to college to begin her sophomore journey. This Tuesday I get to pack up her stuff, drive four hours, then unpack it. There is both joy and sadness in that adventure — joy from watching my little girl take another baby step towards that woman she is becoming, and sadness from watching my little girl take another baby step towards that woman she is becoming. Doggone it if that double edged sword isn’t slicing my heart in two. Yes, I am still smiling. I had the privilege of spending the afternoon and a bit of this evening prepping her campus cruiser for another year. Cables, housings, and basket were replaced. The seven speed derailleur was cleaned and adjusted. 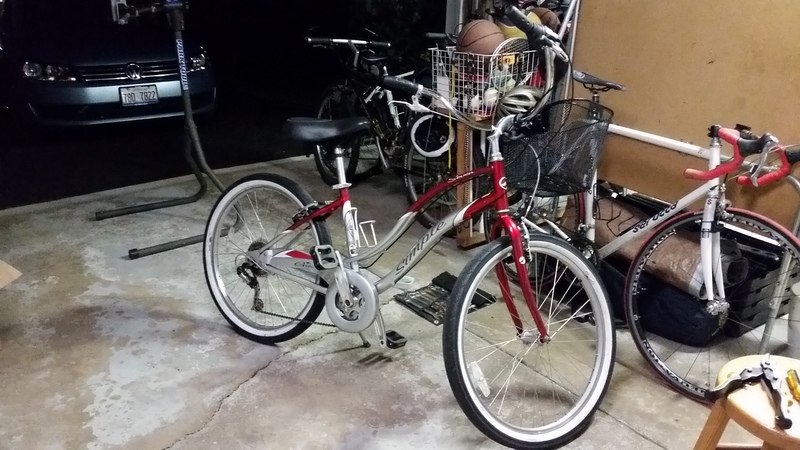 Somehow every creak and squeak was eliminated, proven by a quiet test ride around the block (and again and again… the fat tired rocking chair is kind of fun to ride). Amazed at the success of the tune up as well as the appearance of the cruiser when finished, I had to take pictures. This bike sat outside a dormitory an entire school year, including snow and rain. When I started on the bike earlier this summer, I was not surprised that the shift and rear brake cables were seized. I was surprised at how well the bike bounced back. 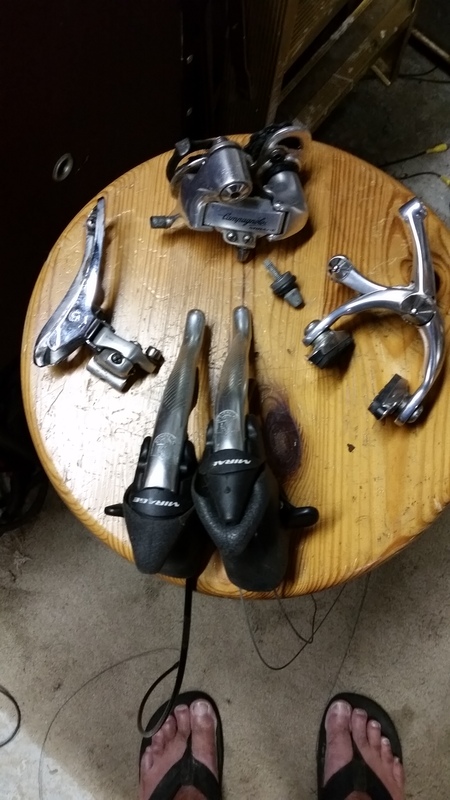 The seven speed Shimano shifter worked flawlessly once it was cleaned, greased, and the cable/housing replaced. Yes, this bike nerd is definitely smiling. On a sadder yet triumphant note, the first Craigslist visitor to see my old Bianchi bicycle bought her. He tried to hide his smile, but I saw the same excitement in his eyes that I had when I first saw her. 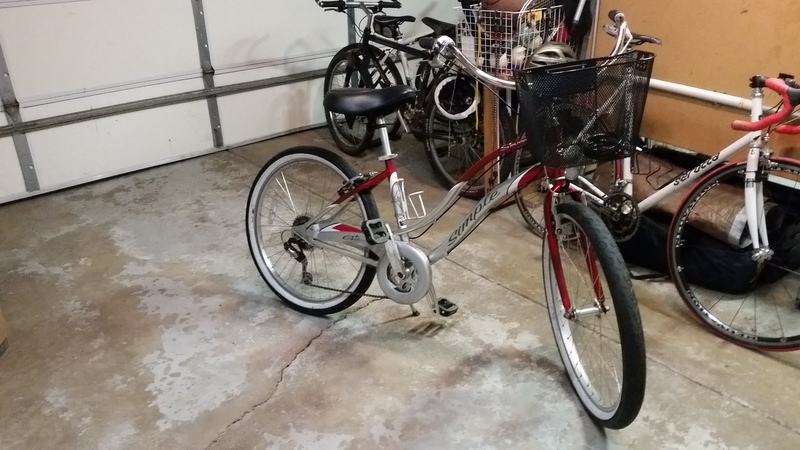 This is someone who will appreciate my old bike. There was a bit of disappointment as I think he thought that the wheels on the bike would be good enough to ride. 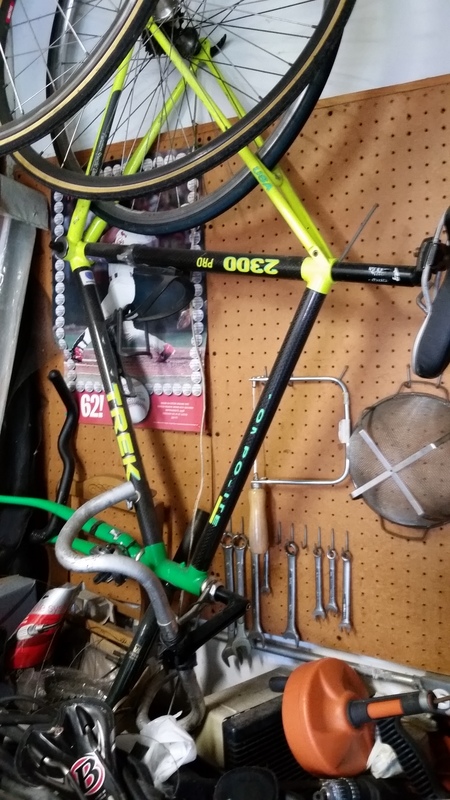 I was real honest, told him that the wheels look good but have always been trash, put the bike up on a workstand to give them a spin and let him listen to the horrid bearings in the wheel. 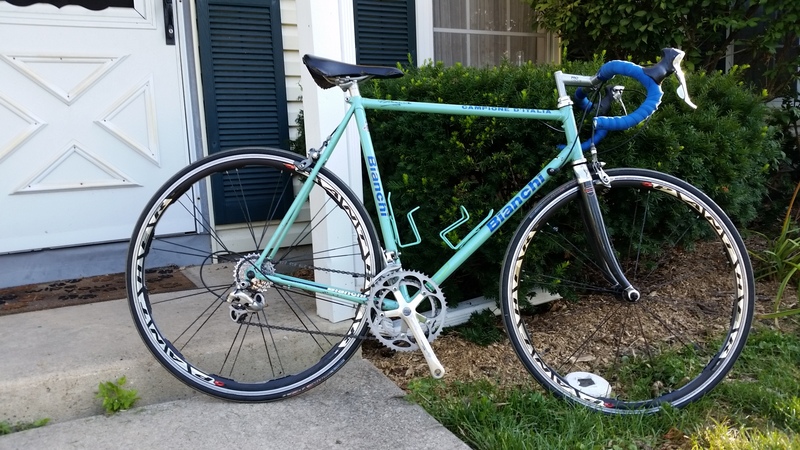 There is no denying the beauty of that Bianchi, though, and he couldn’t resist, even as he made one weak plea for a a better price as he dug the asking price money out of his pocket. He paid the asking price. He did ask me if my titanium Serotta was for sale. Nope, nope, and again I say nope. A few hours from now, I may become Judas, betraying my beautiful savior for a modern day equivalent of thirty pieces of silver. 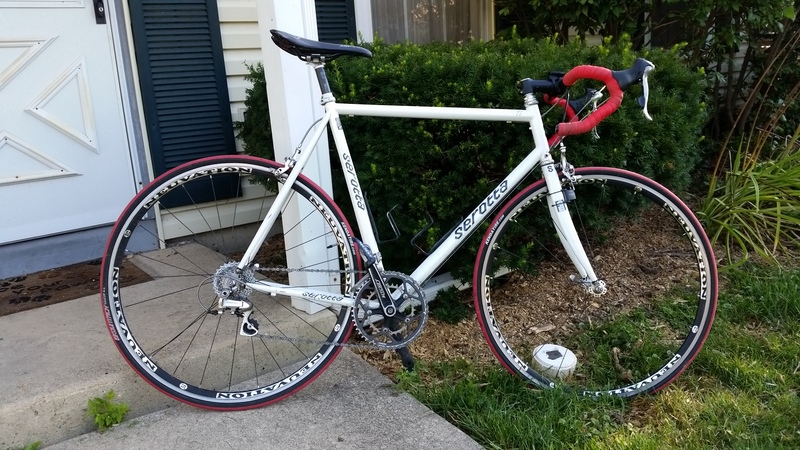 A customer who answered my Craigslist ad will be coming to take a look at my 1990s vintage Bianchi Campione D’Italia, a celeste Italian goddess with curves that will evoke the lust of any cyclist, a double lugged steel framed Aphrodite (believe me, I picked the correct greek goddess) that is pure pleasure to ride. His desire was obvious in his email response to my ad, the lure of Venus a temptation too great for him to handle. I understand, you leering john. Years ago she pulled me in the same way, her vision a siren’s song impossible to resist. I was desperate, weak, incapable of resistance, my current love cruelly parting with the crack of her delicate frame at the moment I really needed her — the last two days of RAGBRAI. Unable to fully absorb the loss, my first love hangs in the back corner of my garage dungeon. So when a friend offered her to me from his stable of beauties, parading her in front of me like one his harlots, I did not even try to resist. That day I took her home, bathed her and restoring her, exposing even more of her beauty. Our first ride was spectacular, dreamlike, one I will remember the rest of my life. 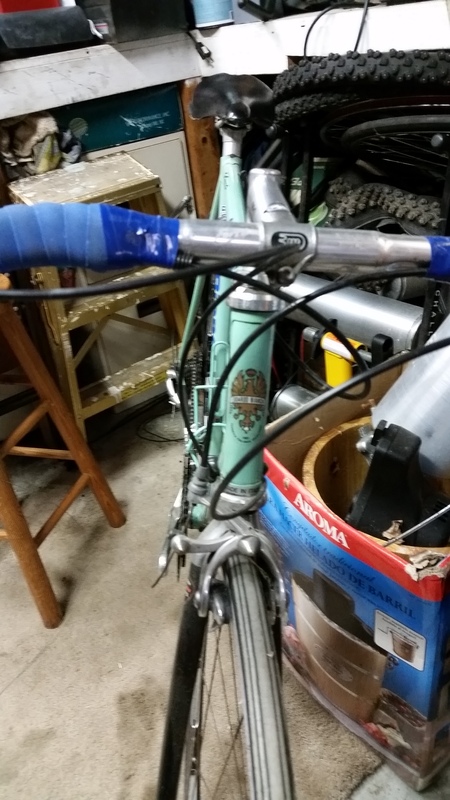 Never before had a bike responded to me like my celeste Bianchi, her appreciation of the power I gave to her evident in the way she moved with my every thrust. I had never felt anything like that before. We met a group of cyclists shortly into that first ride, turned around and joined them, eager to show off my new love. That day we went the distance, more than 70 miles, at or near the front the entire way. I beamed as those riders admired my new Italian girlfriend, felt no pain as we worked perfectly together. There were a few kinks to work out. Though appealing, her Italian components (Campagnolo Mirage) were not practical to me. 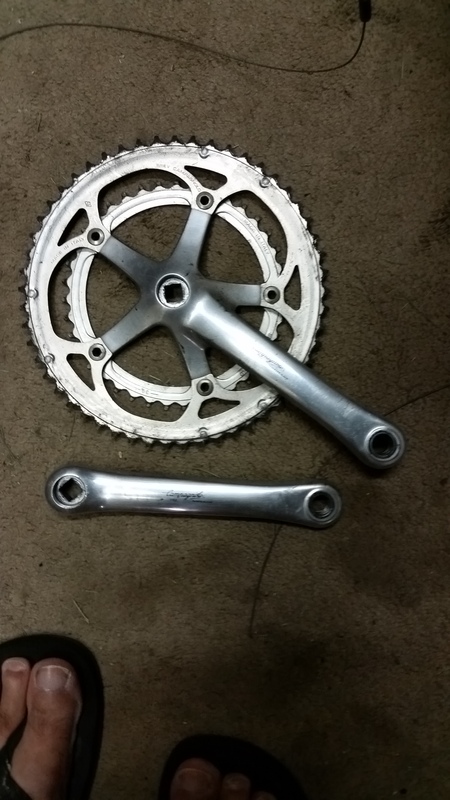 For some reason, I preferred the utility of the Japanese components from my previous girl, so I stripped them from my useless old girl and replaced the Italian on my new Bianchi. To some that was sacrilege, taking some of the luster from my curvy beauty. She seemed to like me more after that, though, faster and quieter. I liked that too. My customer wants the original Italian components, appreciating their precise appeal as a nostalgic work of art. They are still in excellent shape. I didn’t use them much. Bianchi was my constant companion for a few years until lithe Serotta caught my eye, her dazzlingly sleek titanium a stunning contrast to the curves of my Bianchi. Not only is Serotta responsive, she is light. I knew that I had to have her the moment I laid eyes on her. From that day on, Bianchi has been second to Serotta. Serotta has my full attention, Bianchi coming out now and then just for a short ride. If I sell her, I will miss her a lot. A lot of me wants to keep her simply because she is such a work of art, beautiful in a way most of the expensive technological carbon machines can not be. Bianchi is unique. My intent has been to keep her until the day when I can give her my undivided attention again, her ageless beauty something to be appreciated. Unfortunately, it is time. I did make an appeal yesterday on Facebook, hoping that a friend would buy her and allow me visiting privileges. One responded, saying that she is too gorgeous for the utility (winter trainer) he would use her for. He’s right. You gave me some wonderful years, sweet Bianchi. 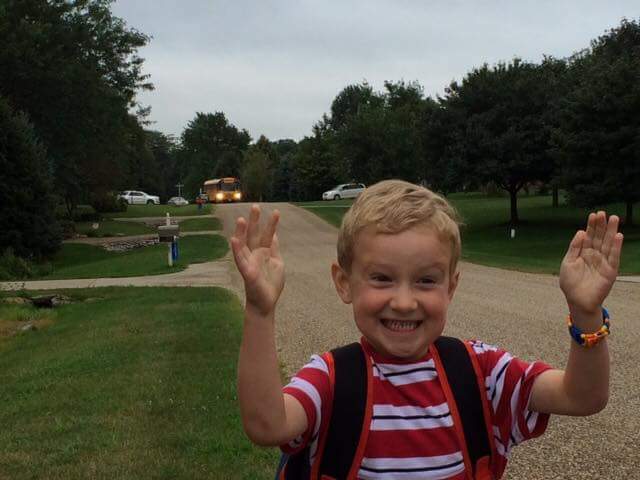 Ithink my nephew, Tyler, was just a bit excited to see the bus his first day of school…. 1986 Chevy Z24. Blown engine at 60,000 miles. Cool car. Money pit. I got so fed up with that car that I let the bank take it back, then stupidly took it back from the back, allowing that car to torture me for many more years. The Z24 may be the reason why I learned to appreciate bicycles so much. If cars were people, the Z24 would be my Newman. Helllooooo, NEW-man. That car loathed me. 2004 PT Cruiser. Too many ailments to name. That car was hell on wheels.. and the wheels actually fell off of that car. Not only did that car hate me, it laughed maniacally every time I had to jump start the PT in cold weather.. which was often. If I knew which junk yard the PT Cruiser ended up in, I would go spit on its grave. 1982 Dodge Omni. Bad flywheel. Took five minutes for the starter drive to find a good bite to start that car. I never really wanted that car, bought a motorcycle soon after I bought the Omni, so it never really got a chance to know me well enough to hate me. 1992 Honda Civic. Completely blew up on the way back from vacation out in the middle of nowhere. My wife’s gynecologist appeared out of nowhere and rescued us by taking our stuff, kids, and Miriam home while I found a way to get the car home. I hated that car simply because it was a Honda Civic. It hated me back. 1987 Ford Aerostar. Transmission. Managed to coax the Aerostar creaking and groaning to work, called Victory Auto Wreckers, put $25 in my pocket. To be fair, I bought the Ford for $1000 when it had 120,000 miles on it, simply because I had already pedaled my bicycle through one entire winter and wanted warm transportation for the upcoming winter. The Ford was a cranky old man that hated everybody for no reason at all. 1972 Plymouth Duster. Seized engine. That car had reason to hate me. It took a lot of abuse since it was my first car. It also lasted the longest of any car I have had without failure — four years. After replacing the engine, the Ruster became a hand me down for both of my brothers, giving several more years of good service. That car was incapable of hate. 2004 Nissan Quest. Bought new. Once the warranty waned, that vehicle nickel and dimed me until it was traded this past March. The engine whined and knocked constantly due to a timing chain problem. That started at 40,000 miles. We drove it over 160,000 miles as far as we know — the digital odometer failed at 80,000 miles. I took careful care of that car, but it just refused to go more than a few months at a time without requiring repairs. The Nissan resented me like a teenage boy. 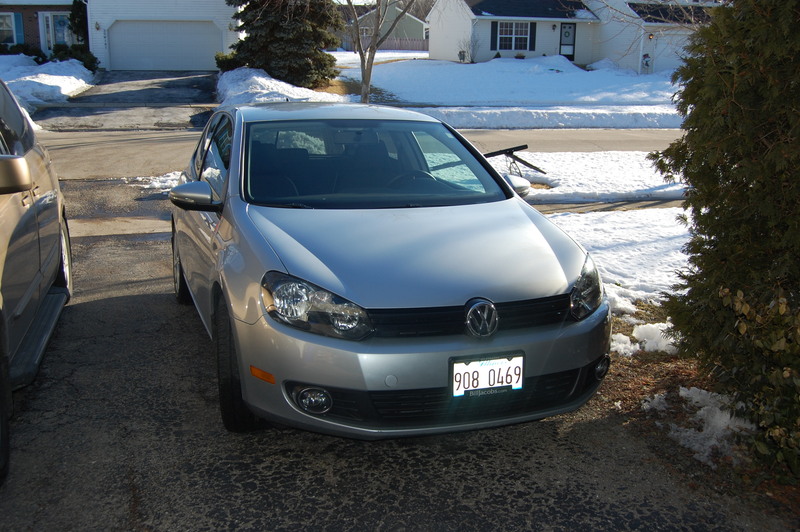 2010 VW Golf TDI turbo diesel with six speed manual, bought February 2014. Towed to the mechanic today. Probably a ruined clutch. After paying my daughter’s Fall college tuition last Friday, I have about a $1000 left in the bank. Looks like I will be saying good bye to that money. This car should not hate me. I have babied it. The VW has seen every expensive maintenance service, has enjoyed fresh synthetic oil every 3000 miles, got brand new tires last May, barely sees a speck of dirt. Why does it resent me? Some day I will find a car that loves me, treats me right. I just know it. 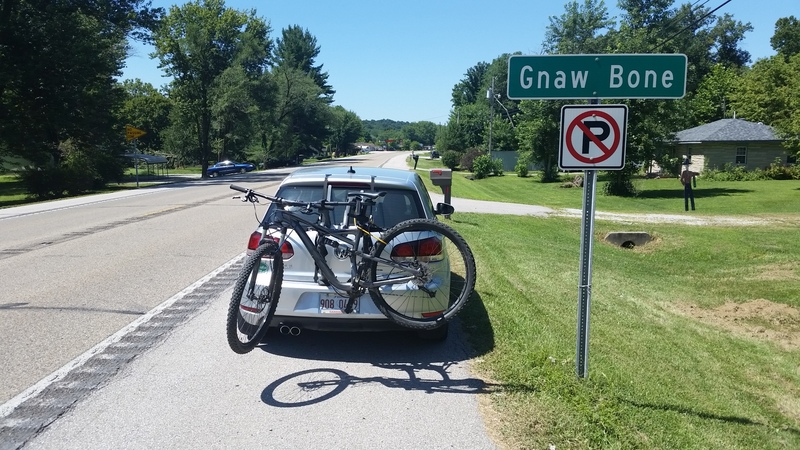 Gnaw Bone, Indiana. I would like to live in a place called Gnaw Bone. What a cool name! There is another reason why Gnaw Bone is cool. It is just east of one of my favorite places to ride — Brown County State Park. Each Fall my friends and I trek there to ride the mountain bike trails, some of the best trails in the Midwest, a guy weekend where we do nothing but ride until we can ride no more. We don’t get in trouble, no shenanigans. Some might say I and my friends are boring, but the some that say that have never banged around in the woods with us. It is the best time.. ever. I went there this weekend. I needed to recharge. My daughter, visiting her college boyfriend after a long summer break, asked if I could pick her up at his house yesterday… just a mere hour or so from Brown County. Sweet. I would make it a three day weekend, drive the 4 hours Friday morning to the park, ride all day and the next morning, tent camp at the park campground (conveniently located at the upper trail head) pick up my daughter in the afternoon, drive home. The plan was foolproof. When I get a chance at an adventure like this one, I don’t need an alarm clock to wake me up to go. The boing-boing-boing of my clock greeted me as I was getting out of the shower on Friday morning. 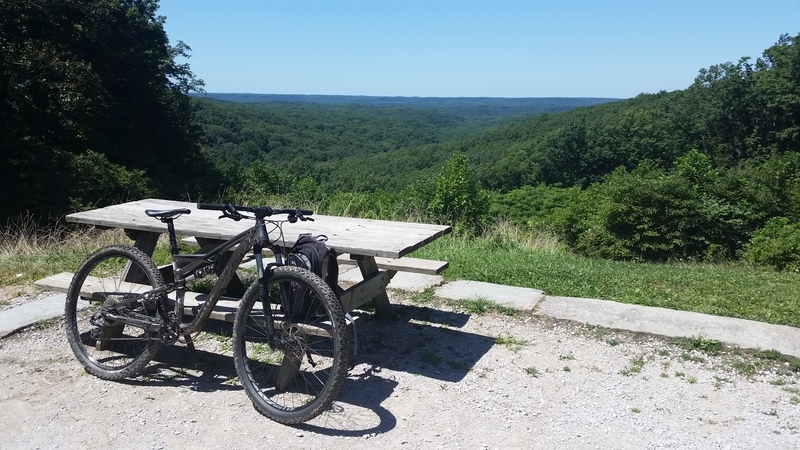 A picture perfect cloudless day greeted me, followed me all the way to southern Indiana, Gnaw Bone, and Brown County State Park. The ranger at the gate thanked me as I handed him the exact change for entering the park, wished me a good ride as my VW buzzed away, focused on the entrance to the campground at the top of the park as we (my VW and I) negotiated the winding shaded park roads. I was too early to check in, so I parked at the campground, changed into my bike clothes in the camp bath house, paused at the upper trail head to check in with my office manager. Nothing urgent. Good. The trails are familiar to me. 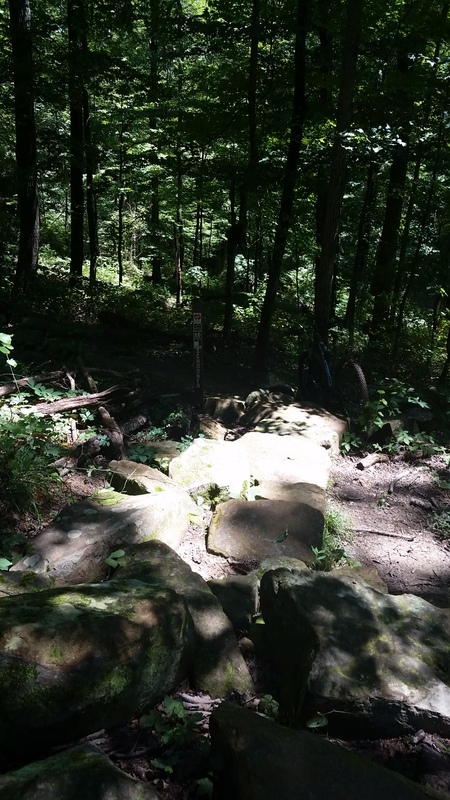 I entered the Lime Kiln trail through the Ogle Lake entrance. Lime Kiln is a fast flowing trail, perfect for warm up, skirting the side of the glacially carved ridges at the top of the park. 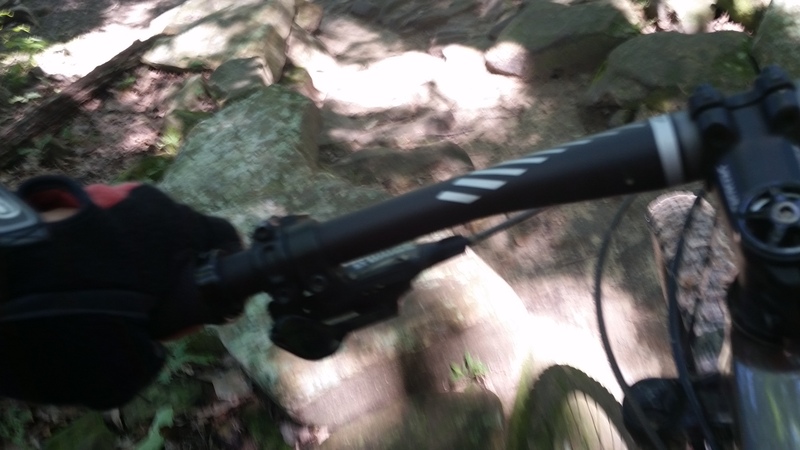 Quickly, almost too quickly, I entered the more challenging Walnut trail, filled with rocks and roots to pop over, switchbacks and vertigo inducing narrow trails with steep drop offs just inches to the side of the trail. That used to make me nervous. I hate heights. Now it just motivates me to keep moving. I had to stop at the entrance to the Schooner trail, just off the side of Walnut, a rock trail so demanding that I can’t ride most of the trail due to the difficulty. My friend, Jon, loves the trail so I had to stop to take a picture to share with him, the magic of FB allowed me to share the picture with him instantly (and he thanked me for it). As I traipsed up the Schooner entrance, a young rider stopped to say hello and to invite me to ride with him. He looked to be in his early twenties. Normally I would say yes, the added incentive welcome, but I knew that I had a lot of riding to go. I needed to conserve energy. I am 54 years old, after all, and the adventure of riding has begun to take precedence over the testosterone rush. Besides, Hesitation Point was next up. I wanted the chance to soak in the view. Brown County is compared to the vistas one sees in the Smoky mountains, something very obvious in the morning from Hesitation Point and the many scenic lookouts around the park..
My young friend also had stopped at Hesitation Point where he met up with two other friends. They had skipped the Walnut trail and had taken the park road to Hesitation Point. My new friend asked if I had ridden the Schooner, awe in his face as well as on the expressions of his friends, familiar with the difficulty of the Schooner trail. I couldn’t lie. I said that I had done two circuits, then admitted to skipping the Schooner. Hesitation Point is just the beginning of some of the best trails. It begins by dropping swiftly into the woods below the overlook, winding along the ridges amongst some of the tallest chicory oak trees in the area. There is heart pounding climbing as well as heart stopping fast descents. Along the HP trail there is a section of rocks that a few years ago I would not even try to ride. Friday, I was determined to own that section. I want my teeth back. They about bounced out of my head. I stayed upright, had to force myself to maintain the momentum required to propel me over the rocks and focus on the best line through. I made it. Experience and a new bike with dual gas shock suspension sure made it easier. Experience should have taught me to make sure that my hydration pack was full. I didn’t. 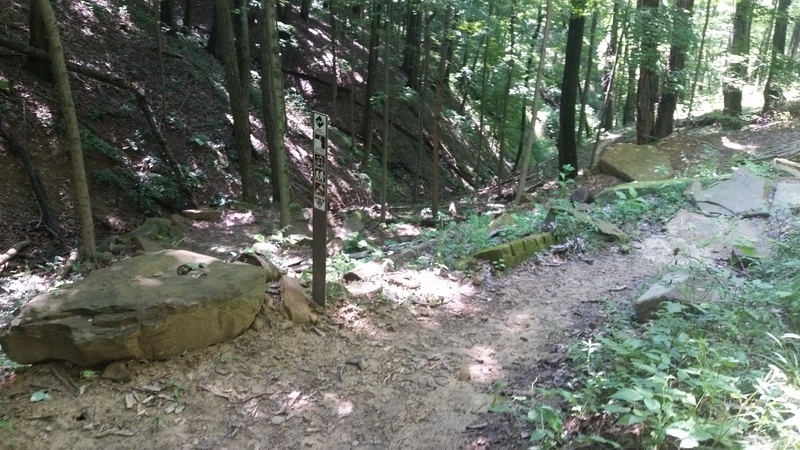 When I got to the entrance to the Bobcat Bowl, an expert trail that starts with rock switchbacks, I sucked the last drop out of my hydration pack. There was still at least two hours or more left to ride. Oops. 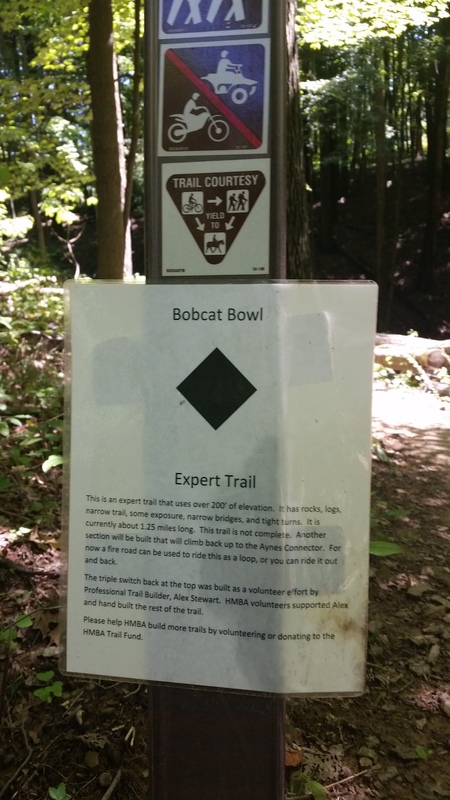 The Bobcat is a new trail at Brown County. Last November, on a cold windy rainy day, I skipped the Bobcat and opted for taking the shortcut to the van. My friends lamented riding the Bobcat that day. Not only was it tough, but they attempted it at the end of a day where the weather had sapped our energy. They were glad that I had the van warmed and ready when they got to it, even skipping the mockery usually reserved for those who wimp out. This time I rode the Bobcat, however. It was a good choice. Although a booger to ride, especially since it is a roughed in trail, it is already the best trail in the park. 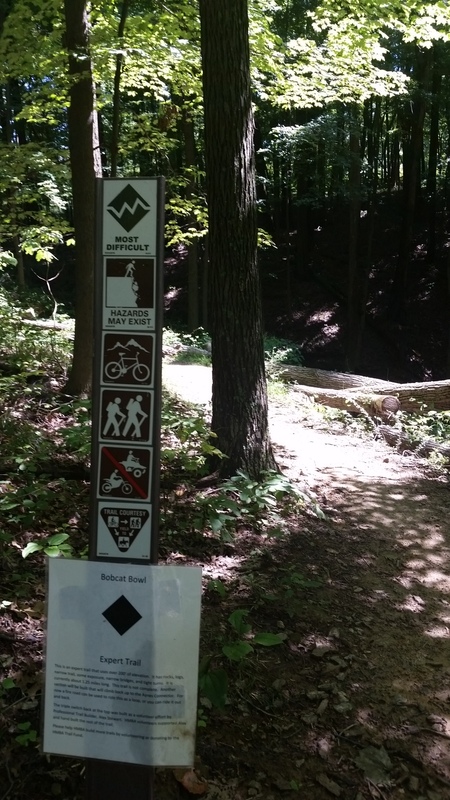 That is saying a lot for a trail system that is so awesome. The Bobcat trail does not connect directly to any of the other trails, at least at the bottom of the trail it doesn’t, so to get to the other trails a steep fire road must be climbed. I was hot, soaked with sweat, and thirsty. At one point on my way up the fire road, I had to stop to rest. I was toast. I love the woods. The peace is incredible, the beauty humbling, the quiet unrivaled. While I caught my breath, the sound of my heart beating thumped in my ears. That could be unnerving. I love it. Even when tired, it reminds me of how much of a gift my life is. Didn’t I say that I started at the top of the park? I did. 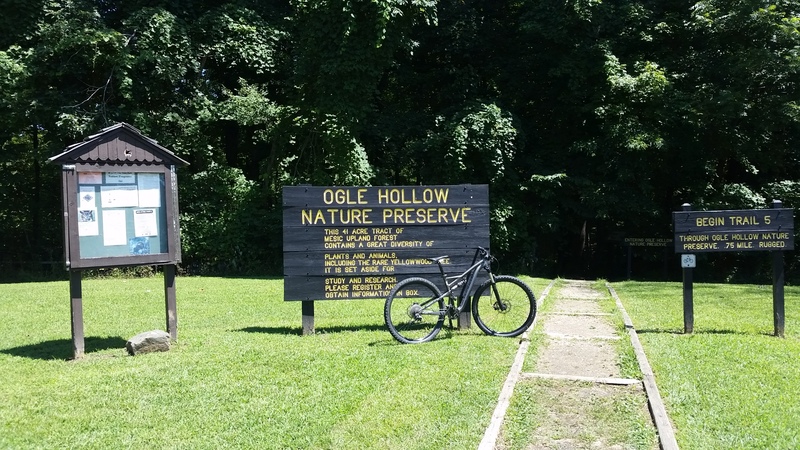 Not long after traversing the Bobcat and fire road, I made it to the bottom of the trails system. There would be around 90 minutes or more riding to get back to the top, depending on how fast I would ride. I was tired, a motivator of sorts. I also knew where there was a soda machine. Ice cold Dr. Pepper never tasted so good, the sugar giving me the boost I needed to make it back to the campground. Cold bottled water waited for me in my car, packed in ice. I checked in, found my camp site, set up the tent, downed three bottles of water (which stayed with me, didn’t leave me), took a long shower, ate a good dinner. 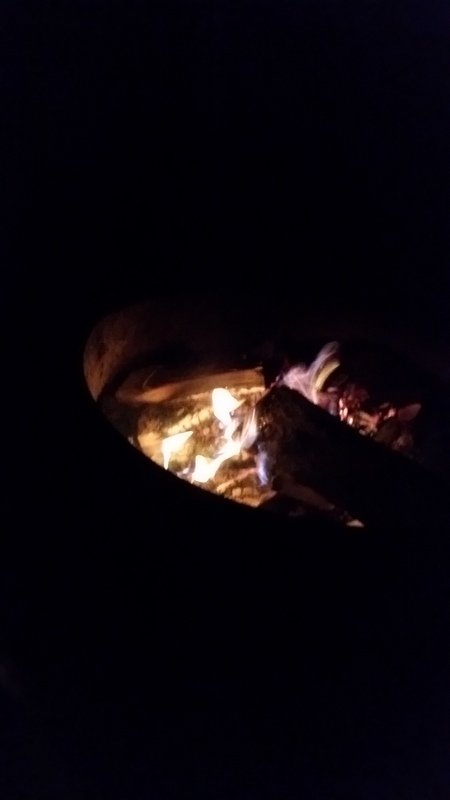 And enjoyed a cool evening in front of a campfire, breathless at the array of stars in the clear sky, my head rested against the back of my chair. A boy who had served as my assistant while setting up my tent earlier in the evening and had stopped by several times to talk to me (as do most of the people who camp — one of the reasons I like to camp), visited me with his father and stopped to admire the stars also. Their flashlights were strapped to their heads, two Cyclops trudging away as they wished me goodnight on their way back to their own tent. It would have been nice to enjoy that time with my own family, I realized. My daughter was with her boyfriend, my son and wife declined my invitation to come along. They don’t like to camp. I didn’t mind being alone. The quiet, the solitude, the chance to do my own thing a welcome opportunity. Some day I hope to be able to share with someone. For now, I will share with you. Thank you, Susie Landau, for inviting me to be one of your Wild Riders and to share one of my adventures with other Wild Riders. There are so many I could share, but Susie’s invitation came with the request to share one adventure with pictures, which I usually do not take the time to do. I hope this long winded tome is enjoyed!